I'm running SOATest & Virtualize, 9.10.3 locally on Windows 10. I'm running the embedded server on my local machine. Are there any special configuration settings that could explain this? This works on a colleagues machine, but not my own. hi, it seems like the embedded repository server did not start successfully. You may check this by looking in the Data Repositories view, the icon for the [Embedded Server] is likely gray (not active) rather than sky blue (active). Have you tried restarting the product? It would help to know if the embedded server not starting was an isolated occurrence or if it persists on your machine. Thanks you! In the Data Repositories view, the icon for [Embedded Server] shows grey, each time i start up the application. I've tried restarting several times, and running as administrator, and the problem still persists, unfortunately. Do you have data in the Embedded Server that you need to keep? I do not have any data that I need to keep in the Embedded Server. This is my first attempt since installation to use it. 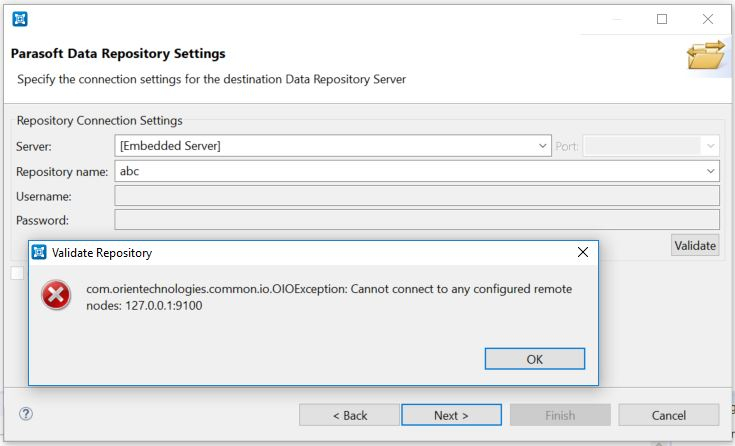 Failed to start Data Repository server Failed to locate data repository shutdown script. First, I would verify there are no old data repository server instances already running, looking for any "java" processes in the background (Task Manager or "ps" command, for example). Then, I would close SOA/Virt then manually delete the "DataRepository" folder from the .metadata folder under the workspace directory (might be something like "C:\Users\username\parasoft\soavirt_workspace.metadata\DataRepository"). Lastly, when starting SOA/Virt again, you should see the "DataRepository" folder recreate itself and also see a second java process launch in the background for the data repository server, if it was able to start. Error when registering with TDM. @benken_parasoft I'll try that, and get back to you! I tried upgrading my version of SOA/Virt to 9.10.5, and that did not seem to fix the issue, unfortunately. Closed down SOA/Virt, see no java processes running in Task Manager. Naviagated file explorer to my workspace, and deleted ".metadata/DataRepository" and ".metadata/DataRepository-stage". Empy the Recycle bin. --They're really gone. Startup SOA/Virt with the same workspace. Try to create the Asset.